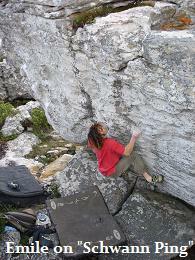 Emile Esterhuizen opened a few more problems at Redhill, near the Vajra boulder. He added a harder finnish to "Dark Lord Sharon", naming it "Shark Lord Darren", this ups the grade to 7B. He also did a low sit start to Silas Kruger's problem "Schwann Ping" 7A, now somewhat harder, and then opened his new project, calling it "The Hobbit" and it receives a grade of 7C. Marijus Šmigelskis repeated the problems shortly after, confirming the grades.